Rodrick is a con man as charming as he is cunning. Hrym is a talking sword of magical ice, with the soul and spells of an ancient dragon. Together, the two travel the world, parting the gullible from their gold and freezing their enemies in their tracks. But when the two get summoned to the mysterious island of Jalmeray by a king with genies and elementals at his command, they'll need all their wits and charm if they're going to escape with the greatest prize of all—their lives. 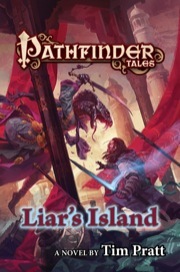 Liar's Island is sanctioned for use in Pathfinder Society Roleplaying Guild. Not quite as enjoyable as Liar's Blade, but that's a very high bar to reach. Roderick & Hrym are an enjoyable duo, and the supporting cast of characters is large and mostly interesting as well. I appreciate the effort to deal w/ the ramifications of the last book's ending, and that by the end of this book, there seemed to be indications of another at least modest change in store for our pair of (anti-) heroes. Editing wasn't bad (for all none of you interested in what I mean by that...fewer than 10 noticeable typos, I'd guess). The Jalmeray setting was pretty cool. I’m sorry to say I was disappointed with this Pathfinder Tale. The storyline is linear, poorly paced and hardly engaging up until the final 3 or 4 chapters. The novel struggles to evoke the depth of the Inner Sea setting – it feels like generic fantasy. It is hard to identify and sympathise with a character who cheats and lies, runs crooked schemes (some of which fail, many of which leave victims), has an arrogant attitude to women, and whose only motivation is money. (I’m talking about Roderick, not a Presidential Candidate). The final few chapters gain pace with more interesting characters such as the garuda. 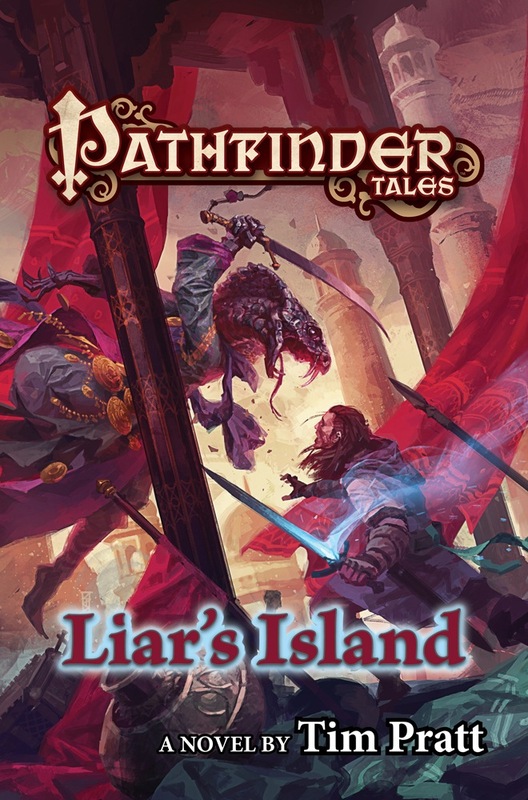 Ultimately though it is too little, too late and Liar’s Island fails to satisfy in the way some of the best Pathfinder Tales have. Roderick and Hrym are back, and this time it's for 1001 Nights style adventure on the island of Jalmeray. It's got death cultist, more djinn than you can shake a lamp at, and the witter banter between man and sentient dragon-sword that you have come to know and love. Pratt does not disappoint. Highly recommended. I like this sequel - after the events of Liar's Blade, Rodrick and Hrym try to get back into the swing of thievery, but they're dealing with the fallout from the last book. Brief tour of Jalmeray from the Inner Sea perspective. One thing I've always liked about Golarion and its high proportion of adventurers means a lot of magic is available, if expensive, and it's the reality the characters live in. Fun scheming, but the protagonists sort of lose the initiative in the second half, even if there's lots of good action, with stops me from granting five stars, but I recommend the book to fans of the line. Yay! More Rodrick and Hrym! It looks like this is the finalized cover? Awesome! Can't wait. After their brief reference in Reign of Stars, I'd love to see a novel teaming them up with Alaeron and Skiver. For that matter, a novel that teams up characters from different Pathfinder Tales authors could be pretty cool, similar to the Avengers movie bringing together all of the heroes from their independent movies. Gotta say, I'm loving these new covers! Very cool to see another by Tim, too! Since you've apparently been reading my mind, I look forward to seeing a sequel to Skinwalkers announced shortly as well. I would LOVE to see this one made up as a Wallpaper with or without the text (preferably without, but I'm not too picky). Really hope Skiver shows up in this, he is HANDS DOWN my favorite character. What are the dimensions of this book? Is it 6.7” x 4.2” like most in the past novels or 8.2” x 5.4” like the recent Lord of Runes? Personally I like the larger sizes for my books BUT now Lord of Runes does not match all the other Pathfinder books on my shelf. I know, 1st world problem. Liar’s Island is in my side cart regardless of the size. I really liked Pratt’s previous novel; my favorite Pathfinder author and that’s saying something. By far my favorite pathfinder characters. We have a release date for the Audio Book yet? I have 2 credits on Audible.com ready to be used! All books going forward (i.e. all those published by Tor) will be in the larger trade paperback size. The Audio Book is out by the way.